Clark David Jennings was born March 8,1923, in the Union Township, Ringgold County to Clark and Mary Leota (Young) Jennings. David lived his entire life within 7 miles of his birth place; always in Union Township except for a short year just across the road in Union County and that was 1.5 miles west and .5 miles north of the farm on Sand Creek. He labored on or for that farm from the age of 17 when his parents bought it until his retirement moved him to Tingley, Iowa. David´s activities centered on being a husband, father, grandfather and one who loved the Lord and His Peoples. David farmed with hogs and cattle his joy; but row crops and hay just necessary to feed the livestock (the chickens, though, were Wilmina’s!). Then, too, remember his introducing the grandchildren to the farm riding along with him in the cabbed tractor and combine. He was interested in Church and the good of mankind. Changing times required much needed outside income. Bill Greene, at the Ellston Elevator, needed a semi-truck driver which led to many trips to Saint Joe, MO, and several adventures along the way. Later the Grand Valley school bus needed a driver for 8 years with the Ridge Road’s snow and mud adding to the children’s’ zest and adventures to and from school. It would be interesting to hear David’s comparison of the horse drawn school bus he drove as a very young man. Tony Sweet asked David to help with street/concrete construction in the Winterset City Park up to Clarke Tower one lean summer. David jumped right in between farm chores. It was a blessing that year! During the farm crisis of the 1980s David became involved in Prairie Fire through people he knew in his church work. David Ostendorf ask him to help with Prairie Fire which turned into a paid position lasting 10 years with office work in Des Moines 3 days a week and many, many phone calls at home helping stressed families who faced the same struggles as himself. 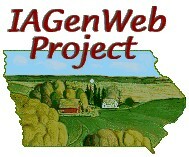 This work involved suicide hotline, blocking farm sales, lobbying the state legislature on many agriculture issues including blocking purchase of Iowa Farmland by foreign entities; and lobbying for the family farms. It was a natural fit for David who was already a Lay Speaker in the Methodist Church and filled the pulpits throughout southern Iowa. In community service David served as a 4-H leader near Ellston, 34 years on the Ringgold County Board of Health, on the steering committee that created the Grand Valley School District and again as the school district was dissolved 33 years or so later. 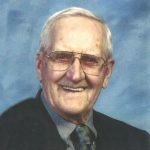 David was the last living member of the planning and construction committee for the current Ellston United Methodist Church. During the construction he was the primary mortar-mixing man for the stone work. Another Church activity David thoroughly enjoyed was the Lay Witness Missions across Iowa. His interest in people and the efforts our nation provides to support one another was exercised through his Church work rather than politics. David is still touching us all with this life lesson. David was preceded in death by his parents; sister Ione Wight. Left to cherish his memory are his wife Wilmina Jennings of Mount Ayr; two children D.A. “David Alfred” Jennings (Judy) of Branson West, MO. and Mary Suzanne Adkisson (Dennis) of Grand River; grandchildren Julia Mae Hunt (Craig) of Des Moines, Jeffrey Jennings Adkisson (Angie) of Winterset, Lyle David Adkisson (Amber) of Ft. Leonard Wood, MO. April Elizabeth Adkisson (Björgvin Gislason) of Ramstein AFB, Germany, Joel Jennings (Hannah) of San Diego, CA. ; great grandchildren Henry Harrison Hunt (Angel baby of Julia & Craig), Dartanyen Lyle Adkisson, Promyce Mia Adkisson and Mykailee Belle Adkisson (Jeff & Angie), Shelby Rae Day (Amber), Emma Jane Adkisson, Clark David Adkisson and Lilly Grace Adkisson (Lyle & Amber), David Lyle Björgvinsson, Fjóla Rae Björgvinsdottir, Gísli Steffán Björginsson and Björgvin Halldór Björgvinsson (April & Björgvin); brother Norman B. Jennings (Marian) of Mount Ayr. Services were held on Tuesday, August 8, 2017 at 10:30 a.m. at the United Methodist Church in Ellston, Iowa. Officiating was the Rev. Bruce Giese. Hymns that were played were: In the Garden, How Great Thou Art, Clair De Lune. Musicians were Sharon Thalman and Craig Hunt. Honorary casket bearers were the church family. Memorials are to the Ellston United Methodist Church.